Let The Packard help you live your modern life with vintage flair. Our apartments are designed to maintain their 20th century charm with smart home upgrades and conveniences. Beautiful hardwood floors and enormous windows accent our spacious floor plans, allowing for ample natural light. Select homes even feature built-in fireplaces, where you can warm up with a cup of tea or a glass of wine after a long day. At The Packard, have the luxury of controlling your home at your fingertips. Featuring video doorbells, smart plug WiFi outlets, smart locks, ultra high-speed USB charging, and smart room air conditioning. At The Packard, we pride ourselves on providing features that set us apart from the competition. From our spacious homes to our ideal location, we go out of our way to help you live well. In addition to our in-home features, residents of our luxury community gain access to our myriad community amenities, from a sophisticated fitness center to our convenient on-site laundry facility and Bike Share Program. 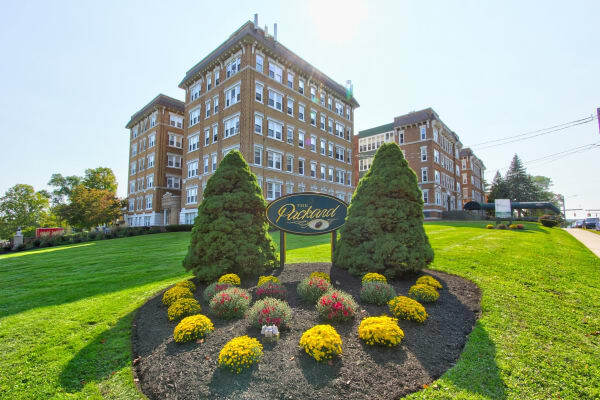 Plus, our family-friendly and pet-friendly community features a professional on-site management team, so The Packard can be here for you every step of the way.